And now for my final thought. So, here we are, with New Year's Eve upon us again. We'll sing Auld Lang Syne, some misguided people will stand around in the cold, alcohol will be consumed, friends will gather. (Not necessarily in that order.) We'll make resolutions, soon to be broken (sorry, but that's what the statistics say). We'll stay up too late and sleep in too long. A good time will probably be had by most. And now, I'm off to make some queso for our party. Happy New Year! So, one day last week, Chad showed up at my work with these. Ordinarily, he is banned from buying me flowers, on the basis that we have enough other things to spend our money on; we don't need to splurge on things that he is allergic to which will die in a couple of days anyway. But I suppose he decided that at Christmas, the rules are relaxed. Chad actually got away better that he might have; all the ladies in the flower shop at the store were trying to convince him to get this or that, so he finally told them, "If I buy all that stuff, my wife will kill me!" That's not entirely true. But it's close. When in doubt, blame Congress. Not bad for a mantra, eh? You don't have to limit your blaming to Congress, of course; feel free to spread it around to any government official you like. Why is Congress the current subject of my scorn? First of all, I was already aggravated with them for that little dance with time that they lead us all in twice a year. And now they are messing with my televison. "Oh, but you can get a converter!" "Order your coupon off the internet!" "Surely you are willing to pay a little to get a better quality TV?" These are the fun little statements that I have been running across on the internet. Obviously, a lot of people are in the tank for the digital conversion. I'm not, although I admit that the transition offers me some hope. At the beginning of the current TV season, I was all filled with angst at the prospect of giving more of my life to the TV. Now, the government has answered the problem for me: on February 17th, TV watching will no longer be an option. I have, however, ordered our coupons from the nice people over at dtv2009.gov (after all, I only have until Wednesday to do so!). Once they are mailed, we'll have three months to decide whether we want to watch TV or not. I certainly intend to at least try a TV-free life for a week or two, just to see what it is like. So in this case I say, Thank you, Congress! You have made it easier for me to not be like everyone else. Well done. In case you missed in on Christmas day, this is another shot of our 4-layer chocolate monstrosity. We couldn't even finish it on Christmas, it was so chocolatey. Even the chocolate-obsessed people we are couldn't eat it all in one day. I highly unrecommend it to everyone I know, plus any strangers who happen by. I really do love chocolate, of course, in monumental proportions, and if I were willing to risk spending a day throwing up, I might have tried to eat "just a bit more" yesterday. Fortunately, I have developed some sense and respect for my body in my 30 years. I was thinking last night about my lifelong relationship with chocolate, and how about 10 years ago, I realised that I would never be able to walk away from chocolate on my own, so I started praying for a chocolate allergy. Instead, the Lord gave me migraines. So now, I have to decide whether a day spent in bed is a worthwhile trade for a large volume of chocolate. If not, then I have to keep my portion small. Funny how God gives us what we need (motivation to exercise my own self-control), rather than what we ask for (complete lack of responsibility in my non-chocolate state). It's almost like he knows best, or something. So, I decided not to bore you with another blow-by-blow account of yet another WTRC race. Instead, I'm just going to give you some highlights of the final race of the year. 1. I passed a Marine! More on this later. 2. This race benefits Toys for Tots, and it was really cool to see the table loaded down with toys. Economic downturn, sparser Christmas that usual, and still we all managed to bring toys for kids who otherwise wouldn't have any. That was cool. 3. And since Toys for Tots is a Marine Corps charity, we had some Marines running with us. 4. The Marines started us of with the whole running-in-formation-while-chanting thing. Fun to watch. 5. I passed a Marine!! 6. Because of the way the course is set up, you have to run across a field away from the finish line at the end, then turn back to the finish line. So you get a good look at all the people who ran faster than you. One of the Marines was trotting along and a little girl (I think she's about 10) sprinted past him, ably cheered on by one of the Marine's buddies (the 1st seargent). Hee! The woman behind them commented to the 1st seargent that he may be looking at a potential recruit. 7. I passed a Marine, and I set a PR!!! 8. Okay, passing the Marine: Actually, I passed two, but one of the ones I passed had stopped for a chat when I passed him, so it's not like I ran him down or anything. And passing the other was kind of like when I win a medal and I'm the only one in my age group; someone mentioned before the race began that some of them were reserves, not on active duty, which meant they were out of practise. And we had some pretty challenging hills on this course, so "out of practise" would have made for an unfun race. Still, I'll take it. Good news: Only two weeks until our first race of 2009. I know you'll mark your calendar. I didn't even know I was playing! And yet, I managed to be tagged anyway. Just like in real life. 2. Answer the six “4″ items. 3. Let each person know he or she has been tagged by leaving him or her a comment. 4 People I tag: Whatever! Tag yourself if you want to play. Chad is currently not carving the turkey-- the phone rang as he was about to start. No big. So, the turkey took forever to thaw (read: it didn't completely thaw, even with 2 more days to thaw than all the experts said it should need), but it cooked really quickly. So quickly, in fact, that I didn't trust the pop-up thermometer and left it in even after the red button said it was "done". A still-frozen turkey just shouldn't cook that fast. Anyway, I'm including this picture of Chad's dessert of choice, which I am going to call "genocide by chocolate" (name stolen from Terry Pratchett). I asked him what dessert he wanted, expecting an answer along the lines of "pumpkin pie" or "chocolate chip cookies". He waited until somewhere around 5 PM on Christmas Eve to come up with this concoction. Middle "frosting" layer: Chocolate pudding. If we survive the eating of it, I'll tell you how it was. Those small pies in the background, by the way, are my mince pies. A must-have for my Christmas. And this is the living room Christmas tree (also known as "the new one"). The red-and-white striped things at the bottom are the "presents" Grandpa wrapped to go with the original tree. I still put them out, because they are cute. I laughed when I put them out last night, though, because they were quite obviously wrapped by a man. Grandpa was really, really upset about me not having a tree. It seems that my husband is now off the phone and the turkey is carved, so it's time to run along before he passes out from impatience. Happy Christmas! So, we're putting up the tree, rearranging the furniture, tidying up the house (not necessarily in that order), and in the course of the evening, I take a plant pot full of dirt into the other room to dump into my big plant pot where I keep all currently-unused dirt. And, the pot slips and dumps dirt all over: 1. The floor. 2. My feet. 3. Some reasonably clean clothes that I hung up very neatly on my bedroom floor. So, Chad orders me not to move while he fetches the trowel (so I can scoop up as much dirt as possible) and the vacuum cleaner (to get the rest of it). So, I've been looking forward to Hugh Laurie on SNL, mainly because I wanted to hear what his real accent sounds like. You know how it sounds? English. Seriously, it is strange to hear Hugh Laurie's real accent coming out of House's mouth. And I am even more in awe than ever at how well he hits the American accent every week. With an Australian in the room, no less, who is using his own accent. So, twenty minutes into the show, and I'm already loving it. Especially this bit when he is talking about blood pudding with Bettie & Jodi. Hee! Hugh Laurie, you rock! Even though it is wild how well you can sound American. And, we're also watching the Trans-Siberian Orchestra on YouTube. (Chad also thinks I can't spell YouTube.) If you haven't been introduced to the TSO's music, skip on over there and check it out. It's hard not to like a group that has electric guitars and violins. Seriously, their selection of Christmas music is brilliant. Have a look. Chad graduated from the EMT Basic programme yesterday. Fortunately, there was neither pomp nor circumstance involved, although his instructor does appear to be manners-free. Okay, I get that he wants to get new EMTs ready for grouchy patients, but seriously, does he really need to pursue that philosophy with everyone? I managed to keep myself in check and not respond with my usual snark and charm, because it was the first time I met him, and I do pursue manners from time to time. Besides, I only spent about 95 seconds of my life with the man, so what difference does it make, right? Tomorrow night: We are staying home. Halelujah. Saturday: Final WTRC race of the year, a wedding, and Chad's work's Christmas party. Sunday: Bible class Christmas party. And that's the game. So we're almost done, and starting on Monday (which is also my sister's birthday), I intend to enjoy my holidays in peace. Just how I will do that I don't know yet, but I'm sure something will come to me. My committee bought me tea. Lots of tea. And a mug that says "tea". And a little box of cookies. And a teaspoon. They were in a couple of gift sets. Sooner or later, I will take a picture and post it. Do you hear those crickets? Yes, it has been quiet around here for the past week. The final preparations and execution of the Christmas tea kept me busy sending emails, making a peppermint wreath, compiling, copying, and counting cookbooks, sending more emails, and I think there were some chocolate-covered pretzels involved as well. Anyway! So I thought that I couldn't have had more fun at a Christmas tea than we had last year, but darned if we didn't do it again. The first speaker talked about entering into God's presence. The second speaker read The Gift of the Magi. The cheer contest was hysterical. The carols were lovely. And, I came home with a surprise gift. Nice. Waddaya know, I managed to get more posts for November than there were days. I would be happy at how much I had to say, but I know that a lot of it was drivel. Thank you, my ever-faithful readers, for sticking with me. So, I have another race report for you. (Good news-- after this one, there's only one more this year. Then we start over again in January. Ha! Ha!) Thursday morning, we ran the Turkey Trot. Now, I've been taking the longer mileage option at every race this year, partly because it's a better value (same price for either race), and partly since I wanted to get 66 miles worth of racing in. Since I already hit the 66 miles, I wanted to hit a 10:00 per mile pace in a race by the end of the year, and Chad had rotations every day except Thursday this weekend, we opted for the 2 mile race. I have nothing of note for myself, except to say that I was already hurting at the 1/2 mile point. I really pushed as hard as I could. It was worth it, though. No, I was impressed by the award ceremony at this race. The womens overall winner is named Brittney. She is a cross-country athlete at Lubbock Christian. I don't actually know her, but I do know of her (and I've seen her in the paper). Traditionally, turkeys are given as prizes at the turkey trot, but when they tried to give her one, she refused it. Why? It is against NAIA rules for her to take prizes for a race. I personally doubt that the NAIA is that worried about a frozen turkey, but what do I know? Anyway, rather than compromise her integrity and potentially lose her scholarship, she left the turkey sitting on the table. The really great moment came when they handed out the children's awards. All age groups get three medals handed out, but they ordered some extras for this race so that all the kids got one. I was really happy to see that, if only because I like encouraging the kids in this sport. When all the experts and whoever are rightly concerned about inactive children, I say let's do whatever we can to convince them to be active. Anyway, in addition to everyone getting a medal and a round of applause, the first-place boy & girl each got a small savings bond. Wow, how many good habits can we encourage at once? 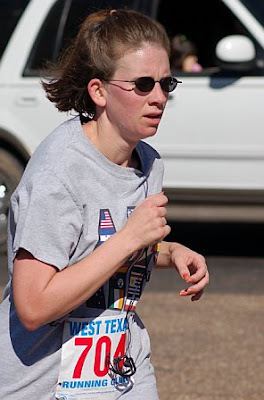 Great job, West Texas Running Club! So, that was November. Enjoy the last three hours of it. Classic for me, anyway, being the '80s child that I am. Was. Whatever. I'm on a quest to see how many attributes I can acquire that begin with "C." And then I'll take my act on the road and audition for a part on Sesame Street. Thus far I have cheekyness, craftiness, clumsiness, and occasional light showers of cleverness. If you see any "C" qualities wandering around without a human to call their own, I'll be here all weekend. Anyway! So here I have photographic evidence that I have been doing something besides taking in vast quantities of sugar. And here we have someone else's idea that I was 100% willing to steal. A patient brought enough of these little angel ornaments into the office last Christmas for everyone to have one, and there were some left over for me to pilfer and bring home. I've hung onto them for a year, planning to make some as take-home favours for the Christmas tea. So, this is my first attempt. I don't think the ribbon is quite long enough to be suitable for your average Christmas tree; at least, not long enough for the angel to hang freely, instead of being squashed up against the branch. So, I've made the ribbon longer for the rest of them. And my final work of... whatever. This is one of two gift baskets that will be a thank-you gift for one of our Christmas tea speakers. The other is just like it. I got these blue baskets in Hobby Lobby's excellent after-Thanksgiving sale today, and decided they were perfect. There you have it, then; this is how I spend my spare time when I'm not blogging. Or cooking. Or eating. Somebody died during Black Friday at Walmart? Somebody actually died? I knew Walmart was dangerous, but this is just ridiculous. There is nothing in any store worth trampling someone for. That's the problem with these sales; people lose all touch with reality in their quest for the latest thing-you-can't-live-without. This post may be hazardous to your health. I was all set to post pictures of the various crafts I am currently working on, but the camera has dead batteries. So, that post will wait until tomorrow. Instead, I decided to regale you with tale of the other creative thing I've been doing with my evening. A couple of years ago, I ran across a fudge recipe on the internet and thought, Why not? Oh. My. Word. My grandma makes the world's second-best fudge. This is better. I'm not joking. And I don't say that lightly; I hold the utmost reverence for my grandmother's cooking and frequently consult her on culinary matters. This stuff is amazing. If the FDA knew about it, they would classify it as a drug. So, before I share the recipe, I want to warn you: If you are watching calories, fat, cholesterol, sodium, carbs, or sugars, this recipe is not for you. If you have small children in your house, you may want to wait a few years. If you are diabetic, stop reading now. If you are a chocolate lover with a sizeable sweet tooth, you are going to think this recipe came from heaven. (I'm actually pretty sure that it did.) If that is not the case, or if you weigh yourself regularly, then you will think this recipe came from Satan. Okay, disclaimer over! If you are still with me, then read on for some of the best fudge the world has ever seen. In a microwave safe bowl, melt shortening and butter in the microwave. Stir in cocoa until smooth. Add potatoes, salt and vanilla. Mix well. Blend in powdered sugar, mix and add nuts. Dough will be very lumpy. Knead until smooth. Press into a buttered 8x8 inch pan. Cool in the refrigerator before cutting. Makes 64 pieces. My suggestions: the first time you try this, make a half batch at most, just to see how you like it. I have cut waaaay back on the sugar because it is just too much; I use just over half a pound per batch. Use an electric mixer unless you are having a "let's have fun getting messy in the kitchen" kind of day. And, I line the pan with waxed paper instead of buttering, because the last thing this recipe needs is more butter. And, if you want to try before you buy, I currently have a double batch cooling in my refrigerator. Drive down our street and listen for the hysterical laughter. Generally, I am opposed to all things IU, but I'll make an exception for these guys. I hope you enjoy it as much as I do. At least, it is for me. But my Christmas shopping is almost done. I still have to buy for one of my grandmothers, and Chad's family, which is a total of five more people. But, for four of those five, I already know what I am getting. Then, it is just a matter of packing the boxes and mailing them. So, the after-Thanksgiving sales are fun. The crowds are-- interesting. The traffic is horrendous. Can't have everything. :) But I was in more stores in one day today than I have been since I lived in Glasgow and used to amuse myself by "shopping" in every store on Argyle Street on the odd Saturday. Man, I miss those days. Or, perhaps I should borrow from the new gymnastics rules, and say, "Three up, three count." Whichever. 1. Finish in the WTRC's "66 Mile Club." 2. Finish a half marathon. 3. Finish a race in a 10 minute per mile pace or faster. 1: Did it. Made it to 66 racing miles on November 8th. So come the year-end dinner in January, I get the really nice "66 Mile" t-shirt. I'll be wearing that thing to church, to work, and everywhere in between. There will be no parting me from that shirt. Except, you know, to wash it every now and then. 2: I think I may have mentioned that I ran a half marathon. I could have made it to 66 miles without the half marathon, but it certainly helped. 3: This one has me tickled pink. And I don't even like pink. But we ran the two mile race at the Turkey Trot this morning, and I finished in 19:12. For those of you keeping track at home, that's 9:36 per mile. I nearly collapsed when I came across the line, but it was mostly from happiness. And then my mp3 player broke. Can't have everything. Three up, three down. Now to work on my 2009 running goals. This is, presumably, the most thankful day of the year. And I have a lot to be thankful for. A LOT. I don't have to look high or low, or even off to the side, to find reasons to rejoice. I do, however, hate the whole "Let's go around the table and say what we are thankful for" tradition. (If you do this at your house, please do not invite me to Thanksgiving dinner. Thank you.) We never did it in our family, and I am so glad, because I was so painfully shy as a child that I think I would have foregone dinner sooner than speak aloud before my entire assembled family. Apart from putting everyone-- especially children-- on the spot, my thought is that such a tradition encourages superficiality, in a "Quick, think something up so that we can eat!" kind of way. So, it is not something we pursue in our home. And I don't intend to do so when we have children. But you know what we do? When we spot a reason to be thankful, we talk about it. Right then. Mostly these conversations are about people, because that is just how it works for us. And I think that is a good thing. And when we do have conversations about thankfulness with our children, I expect them to happen on a daily (or almost-daily) basis. If not, then I think I will have missed out on a big part of parenting. So, Thanksgiving is all about the food. So, my turkey is currently roasting in the oven. Why? Well, we want to have "the meal" for lunch, but we're running a Turkey Trot at 9 AM, and there is nothing on this earth that will convince me that it is a good idea to turn on the oven and then leave the house for an hour. So, I'm cooking the turkey the night before. I've read that you can reheat precooked turkey in the oven, but my answer to that is: Hello! I have a microwave! Once the turkey is done, I have to cook the cornbread, because it has to sit out overnight and get stale so I can use it for the stuffing. Except I don't stuff the turkey, so I think it is technically called dressing. Or something. Anyway, that stuff with breadcrumbs in it? I have to make the cornbread first. And I gotta tell ya, I got my current dressing recipe off the internet a couple of years ago, and it is fan-tab-u-lous. It's a lot of work, but totally worth it a couple of times a year. So this is my sixth Thanksgiving turkey. The first year I did it, I didn't know about taking out the neck and giblets ahead of time, so after it was done cooking, I was all, "What's this paper bag in the turkey?" Now that I think about it, this may be the first year that I remembered to take out the neck before cooking. And I probably wouldn't have thought about it, except I had the remains of a whole chicken sitting in my kitchen, so I tossed the neck into the pot to make "chicken" broth. I guess it's poultry broth now. I don't really like cooking meat at the best of times-- it tends to leave a greasy film on my glasses (and, presumably, the rest of me as well)-- but it is extra sad when I can hold it up by the wings and lead it in a little dance in my sink before putting it into its pan. I have no actual conscience qualms about eating animals, but I do have to block from my mind the fact that it used to have a face. And cartoons are not my friend here, since it may well have also had a voice and personality. I'll try not to think about Chicken Run while enjoying dead bird tomorrow. No NCIS for us tonight. Bummer. The trade-off is, I'm watching A Charlie Brown Thanksgiving. Had NCIS been on, I never would have changed the channel to see what else network TV had to offer this evening. There's nothing about Peanuts that I don't like. In particular, I am a Snoopy fan, but I'll watch any of them in a pinch (like when Snoopy is not onscreen). Snoopy vs. the lawnchair is probably my favourite part of this Thanksgiving special (although the dealing of the food is also priceless). Another new face on my blogroll... or rather, six new faces. The Skelton family are in Romania, telling people about Jesus. And they have a blog to let the rest of us have a peek into their lives. Check it out! So we were driving home last night, and I thought, "What are those things in the sky? Are they planets? We can't see stars in the middle of town." Tonight while running, I saw them again, and thought, "Are those things closer together tonight than they were last night?" I decided that at least one of them must be Venus, because honestly, we see our solar neighbours a lot. I got home and consulted the wellspring of all knowledge-- Google-- and discovered that one of them is Venus! The other is Jupiter, and lo and behold, they are closer together today than they were yesterday. The two of them will be doing their celestial dance for the next week around twilight, so go outside and look west after supper. They will be at their closest next Sunday & Monday evenings (Nov. 30th & Dec. 1st). And, the brighter of the two is Venus, only because it is closer both to us and to the sun. And if you have a telescope or some binoculars, the stargazing will be all the more enjoyable. My favourite time of year: Shopping Season! Yeah, that's what I mean when I say "Season's Greetings!" I love shopping for Thanksgiving dinner. At no other time of year do I buy a turkey (which is brilliant for us; we can freeze the leftovers and still be enjoying it come New Year). It brings me a level of satisfaction that is, quite frankly, worrying. Then there are the other gems: flour, pie pans, yeast, yams, sage (I LOVE sage! ), dehydrdrated mince, canned pumpkin, cranberry sauce (the three things that I'm unwilling to make from scratch), waxed paper, fudge ingredients, hot cocoa ingredients, chocolate chips... Not only is this the shopping season, it's also the baking season. I love it. I think the reason that I don't bake for the other 11 months of the year is that I go so overboard from Thanksgiving Day to Boxing Day. But if you come visit us in the next 5 weeks, you will be fed well. So, just how many of them ARE there? My supervisor informed me today that the new Bond movie is good, but it is all in jiggly cam. So, I guess I'll be waiting for the DVD-- I'm not sitting through another one of those. I've also heard that Fireproof is worth a trip to the theatre. Our Bible class chairman actually went so far as to say, "If you only go to one movie a year, make it this one." Dude. I didn't even go to the theatre for Prince Caspian. Actually, I couldn't even tell you the last movie I saw in the theatre. Pierce Brosnan is my favourite Bond. In case you were making a list, or something. ... though perhaps he has less foresight. Yes, this post is about the young man who has been a part of my life for 28 years (his birthday was Thursday, so... 28 years and 2 days). And I would like to preface all that mocking that I am about to do by saying that on my list of my favourite people on earth, he is currently tied for #2. (Tied with our sister, of course... I couldn't possibly choose between them, except for when I am annoyed with one or the other (usually our sister), in which case the other one temporarily gets the #2 spot all to himself.) Also, I can rest safely in the knowledge that he never reads my blog, so I can pretty much type whatever I like with impunity. Hee! That'll teach him. This is the great part. My brother's girlfriend has two children, so he has pretty much taken on the role of the father figure for them. In the course of our conversation, he said, "Go clean your room!" I kind of snickered and asked, "Who are you talking to?" It was his girlfriend's son, who was finding every excuse there is to avoid cleaning said room. A few moments later, my brother said, "Do you want to be grounded? Then don't come out of your room again until it is clean." If I had been driving, I would have crashed the car at this point. As it was, I nearly laughed myself silly, to the point that Chad was all, "What? What's going on?" Billy naturally wanted to know what I was laughing at, so I asked him, "Did you really just tell a kid to clean his room?" So Billy was all, "Yeah," in the, "What's your point?" tone of voice. So I asked, "Who is going to make you clean your room?" Now, let me just spell out my point for you here... from birth until he went to college, my brother never cleaned his room. Never. He kept a path clear from the door to his bed, and that's it. Occasionally I would be ordered to "help" him clean it, in a "He's too little to clean his room by himself" kind of way. (He remained "too little" until long after he was taller than me. Not kidding. Also, for those non-eldest children out there, "help" means "do it for him".) As far as I know, his room at home still has a path from the door to his bed. At least, that is what he indicated when he said he just intends to torch his own room and start over. I am happy to say that my brother kept his room at college very clean, because they had inspections and he got all kinds of cool stuff for having the cleanest dorm. By "cool stuff", I mean cookies and pizza coupons. That's all my parents would have had to do to get him to clean up his act; offer him fast food in exchange for finding his floor. I bet they wished they had known that about 16 years earlier. Anyway, what have I learned from this whole (highly amusing) incident? Never parent my children (or anyone else's) while on the phone with one of my siblings. I have a Canadian coworker, who has made huge contributions to my sanity over the course of the past three years. So I wandered to her desk yesterday morning, and announced, "I am here in my capacity as someone who asks stupid questions." She laughed and said, "Thanks." My question was, "Does Canada observe two minutes of silence at 11 AM today?" Yes, they do. A lot of countries do. Why don't we? I have a variety of theories, but here's what I have settled on: We do not know war like Europe knows war. We don't even call November 11th "Remembrance Day". We honour our veterans, and rightly so. We fly our flag, as so we should. But we don't remember. We have been blessed; our cities do not have the scars of war still upon them. Our elderly do not tell stories of huddling in air raid shelters while the sounds of planes and bombs roared outside. We do not have a war memorial in every town. We do not have these collective memories handed from one generation to the next, as Europeans do. Our people, our families, have been touched by war. But our land, this past century, has not; not like France, or Poland, or Russia, or Britain. Or Iraq. And that, I think, is why we do not observe the collective moment of silence; we do not know, as they do, the relief of hearing two minutes of silence after years of hearing nothing but suffering. Think of the poppies. Remember. And give thanks. So, when I stumbled across a blog dedicated to making fun of the general inability of the English-speaking world to use apostrophes correctly, I promptly added it to my blogroll. Go here to see what all the fuss is about. And, if you thought I was done talking about my half marathon, you're completely loony. As with every other subject, I intend to harp upon it until I am distracted by something else. I didn't mention before that a pal from my Aim days (he was an assistant, I was a student; our paths rarely crossed until he married my teammate's sister. Then our paths still rarely crossed. Oh, well, I know his name, at least.) also ran the half marathon; he and someone else I kind of know were standing in front of me at the start. I was sort of with them until about mile 3, when they disappeared from sight for the remainder of the race (and finished 15 minutes ahead of me). Well done them, I say. Then today, when I spent most of the day rejoicing that I could walk again (and mostly get up & down from chairs), I saw them in the park. Running. That's right, three days after running a half marathon. And they were smiling. Okay, I start training again next week. And this time, I'm serious. My supervisor took one look at this photo and said, "Wow, that looks painful." To be fair, Chad said I look cool in this picture. "As soon as I cross that line I can stop running." "As soon as I cross that line I can lie down." "As soon as I cross that line I can throw up." "Hey, someone is screaming my name." "Can I run faster? Nope." "Who measured this course? Were they sure?" "Where is that dang line?" Yeah, I'm just a bit sore today. To get off the couch, I sort of roll on to the floor, crawl to a sturdy chair, and lift myself up by my arms (kind of like Nastia Liukin at the Olympics, but without the whole lift-my-legs-straight-into-the-air thing) until I get to a standing position. I'll be sitting still, or lying down (had a lovely nap today), and forget that my legs are very very angry. I'll start to move, and then remember very quickly. With a great chorus of "ouch ouch ow oh holy crap ouch ow geez!" I still say it was worth it. Has somebody seen my cane? "Customer needs assistance in the High School Musical aisle." I'm sure the customer wandered in by mistake and is now desperately trying to get out again. Right? Anyone??? Seriously, there's a High School Musical aisle? A whole aisle? And to think people are worried about what President Obama might do to our country. It took me a shade over two and one-half hours (which was my "medium" goal). I wasn't dead last (much to my surprise). I was still able to walk afterwards (although that happy state may not last). And when I got home, Chad had my ice bath (yikes!) all ready for me, as well as lunch (Halelujah!) already cooking. So, to give credit where credit is due: My faithful training partner, who had stayed with me through early mornings, long runs, and faster-than-agreed-on paces, stayed in bed this morning. Actually, I told him to; he has a rotation today and he didn't need to go all the way out to sit around for that long with just a couple of glimpses of me along the way. Anyway, I couldn't have done it without you, my dear husband. I couldn't find my gloves or my headband when frantically searching the house at 8:10 AM (I had planned to leave at 8). I gave it up and hoped that it would warm up quickly, but I was saved from frozen fingers by my running pal Tammy, who loaned me her gloves. Fun gloves. They had Scooby-Doo on them. And, finally, I don't know if I've mentioned our friends Shannon & Wendy before, but they were among the first people we met when we first started attending South Plains. Turns out they are runners, too. They were both at the race today, and both of them cheered for me when I passed them. Wendy ran the 2-mile race, and while I didn't see her, I knew that she had passed me because she was screaming "Go Susan!!" Shannon didn't shout quite so loudly, but he was standing at the finish, and provided an extremely-needed boost as I ran up the hill and crossed the line. And then afterward, he was very complimentary about my running progress before encouraging me to stretch a lot. And I took his advice, because the last time I ignored something he said about running, I was very very sorry. So! I can now truthfully say that I am a half-marathoner. Next up: Austin, February 15th. Chad and I had an animated discussion earlier about previous U.S. capitols. (Meaning capitols under our current constitution; it turns out that there are eight different cities that Congress met in before finally settling in D.C. Personally, I'd be delighted to see the last of Congress in my town; in fact, if someone wants our city council, I'm willing to talk.) Anyway, I said New York was before D.C., Chad said Philadelphia was the only capitol before D.C., and we were both wrong. And I know that I should have learned that in 5th grade, because U.S. History is a 5th grade subject in Indiana. I don't know about California. Anyway, if you're keeping score, NYC was first, Philadelphia second, D.C. third. And there were some other cities before the Constitution was ratified, but you can check it out yourself if you really want to know. Anyway... I admit that I have never once gotten all the 5th Grader questions correct. I always manage to miss a couple. But so far, I'm doing pretty well against Gene Simmons. Yep. Still getting spam in German. So, I'm something like 37 hours away from my first half marathon. I am nervous; I am excited; I am ready; I am looking forward to noon on Saturday because, unless something goes really wrong, I will be finished by then. I am also totally stoked (don't think I've ever used that word) about my new mp3 player. Yep, this is going to be a fun race. Naturally, I have been plagued by every minor ailment that I can think of over the course of the past week, so I haven't done any running. I suppose that means I'll have very rested legs come Saturday. Good thing I use the first mile of the race as a warm-up, anyway. So! I have taken the advice of every running magazine/website/article I have come across, and have practised for race day. I know exactly what to eat, what to drink, what to wear, etc. The only problem will arise if the running club runs out of bananas before I get to the aid station. That would be disastrous, actually; I've eaten a banana mid-run every week, and I don't know how well I would do eating something else. The nightmare situation would be for my stomach to freak out on me, because a freaked-out stomach is not much fun when in the privacy of one's own home. I imagine it would be much less so while in the middle of a 13-mile run. Yeah. Now that I've loaded you up with that image, I'm going to watch CSI. Happy Thursday! So, I've seen some really depressed people today. And I admit, it amuses me more that it probably should. I can't say that I don't understand, though, because I also used to care that much. The woman who sits next to me at work says that there is a big difference between a teenager acting that way and adults doing it, but what do I know? I do know that I am neither depressed nor elated, but somewhat curious to see what happens next. Indiana managed to go democrat for the first time since 1964. I didn't know they had it in them. My home county can be counted on, though: 65% McCain, 35% Obama. I want to meet that 35%. At the risk of repeating what everyone else has already said... whatever you think of his politics, it is a great day for the U.S. It's about dang time that we elected an African-American to the presidency. Republicans: Now is your chance to take the high road. Now is your chance to step up. Now is your chance to not act like the Democrats have been acting for eight years. Do it! Please! I'm watching CBS because NBC annoys me, and because I have always liked Katie Couric. I'm about to change my mind about that. To be fair, I suppose anyone would be annoying after having nothing new to say for a few hours. ... but it still counts as multitasking even if my computer is working, right? During the course of my highly entertaining, edge-of-your-seat voting series, I think I may have mentioned that as a teenager, it was my intention to return to Indiana as soon as I finished aim and get involved in Indiana politics. And had I done so, I would have no fingernails left tonight. Boy, am I glad that God led me in a different direction. I'm getting spam in German now. And I'm really glad that I don't speak German, because it didn't look like a particularly encouraging message. Anyway! This is further exhortation for you to go check out Crummy Church Signs. I haven't laughed so much in months as I have done while reading these in the past couple of days. Also, please do remember to vote on Tuesday. You need not feel obligated to watch the entire evening of coverage on every network there is, unless you just really want to. Just leave the clocks alone, can't you! I've blogged multiple times about my feelings about Daylight Saving Time. Well, here we are again. I don't care if I get an extra hour of sleep; changing the time totally messes with my head. Just like everything else. Hotch: Isn't it about time for him to have a love interest, or a relationship with his son, or at least a "Hotch" episode? Rossi: I'm still calling him "Rizzo," because that's fun for me. Isn't it time we learned more about him, too? Garcia: What's going on with her and Kevin? We haven't seen him in a while. Morgan: So, there's a new girl that he's already expressed an interest in. Fans are saying Garcia won't be happy. I say, why not? She has Kevin. Doesn't she? J.J.: I like where they are going with her. I particularly like that we saw her doing more "work" than usual this last episode-- I suppose in a "look what the team will be missing" kind of way, in preparation for her to go on maternity leave. Still, it was good to know. Prentiss: Is there a language she doesn't speak? I like her more every week, but I think she is also overdue for a Prentiss-focused episode. Reid: Yes, I left the boy genius for last, because the writers seem to have forgotten that he is a genius. For the second half of last season, and so far in this one, all he has been allowed to do is colour in maps. I'm a bit worried that they've run out of things to do with him. Although, Wednesday seems to be another Reid episode... let's hope. So, Wil Wheaton guest starred in episode four this season, and I read his blog yesterday describing the experience. And it was a fun read, which made me appreciate the episode even more. Yeah, ESPN's College Gameday is here in Lubbock this week, and I am toying with the idea of going over there this morning. I have to decide fast. Tech is playing Texas, and I honestly couldn't care less about the outcome. I tried to care less, and was unsuccessful. I mean, there is part of me that has some fiendish delight when Tech loses, but ESPN is coming all this way... so yeah, I don't care. We'll see what happens. So, my TV obsession is starting to wear off, thank goodness. I am still addicted to NCIS and Criminal Minds, but at least I'm down to two shows. I've spent most of my life with one TV show at a time, so I readily admit that having two-- especially two that are so similar-- is really messing with my brain. Okay, so I'm also into Life, but it has been moved to Wednesday nights... right up against Criminal Minds. But, I will be taking the advice of-- yeah, don't know who-- who suggested watching Life on the internet, which is not an option with Criminal Minds. Enjoying Letterman at the moment... but I'll have to go to bed sooner or later. 1. Put your iTunes/Ruckus/Napster/etc on shuffle. Voting, Part And now for my final thought. Midterms in '06 (the Democrats rejoice): Chad worked the polls. I read the rules very carefully; I was allowed to bring him lunch and supper, but then had to leave immediately. I didn't even stick around to vote, because we voted early that year. This year: I'm not voting early. Call me crazy (there are so many who do), but I like voting on election day. Remember the six-year-old who thought voting was a magical, exciting thing? There's still a bit of her in me. My heart still skips a beat when I get my ballot and walk to the booth, like the 17-year-old that I was in '96. The long lines on election day are part of the fun. Yeah, I know I'm crazy. I no longer think voting is magical; I know it is a lot more serious than that. I no longer think it is a matter of getting my favourite party as much power as possible; I know it is much more grey than that. In fact, I longer have a favourite party; I have learned that truth is not to be found in politics. On November 4th, we get to overthrow the government. (Yeah, that was a West Wing reference.) Please use this gift wisely, but do use it. Voting, Part Please let this be the last one. So, what are we up to? '02 midterms? Yeah, I don't really remember anything about that election. Seriously, I don't. I know the Republicans made gains in Congress, which is unusual for the party with the sitting President. I know I voted, because I never miss. But that's all I can tell you about it. The day after the election, a woman came up to the drive-up at Chick-fil-A. Her radio was on, and she announced to me with much delight, "Kerry just conceded!" So, I announced this to the room in general, causing a mixture of celebration and sadnes behind me. One of my coworkers standing nearby said, "Man, that's not fair! I voted!" I did take just one moment to inform him that it was, in fact, quite fair; that indeed, fairness is what our voting system is based on. He was not convinced. Voting, Part She'll have to run out of things to say soon. I voted in Texas for the first time in the '00 elections. That was also the only election that I have ever had a pollster call me. And it was a boring, boring phone call. There were quite a few episodes about polling on The West Wing (if you don't know by now that I'm a Wingnut, then you haven't been paying attention), but for some reason they never mentioned how boring it is to have someone endlessly ask you questions for 10 minutes. So, I'm putting my vote up for sale, if anyone has a candidate you'd like me to vote for to ensure his/her loss. I'm really good at it. Serious bids only, please. Voting, Part Dang! We thought she was done. When last we saw her, our intrepid young voter had just stepped inside her first voting box and pulled the levers. Normally, one gets a nice, pre-stamped or postage paid envelope to send one's ballot back in. Not so when one lives across the pond. Just in case you were wondering. When I told the woman at the voter registrar's office in Greenfield that I would need my ballot sent to Scotland, she looked positively dumbfounded. Not a request I suppose they hear much in Greenfield, Indiana. Also during this time was the whole Lewinskigate nonsense, which started my disenchantment with the Republican party. They've never gotten me back. The details were changed for the show, but this town does exist, and they all gather at 12:00 AM the day of the NH primary to ensure that they are the first in the nation. Okay, so actually several small towns in NH do this (all small enough that all the voters fit into the town hall or the high school gymnasium or whatever), but the one with the most media attention is Dixville Notch. If you really want to know more, go to Wikipedia; I refuse to reprint the article here. So, back to the fictional Hartsfield's Landing in TWW. At the very end of the episode, the camera focused on a TV showing CNN's coverage of the Hartsfield's Landing vote. Someone was calling roll, and each person stepped forward to put his/her ballot in the box as he/she was called. I don't remember the girl's name, but we're going to call her Sarah. The man called her name, then announced, "Sarah's 18, everybody! This is her first vote!" Then he said to the smiling Sarah, "Step up and cast your vote," while the rest of the town applauded. That is possibly my favourite TWW moment ever. I can't watch it without tearing up. In fact, I can't blog about it without tearing up. And I mention it here because that amazing day after I received my very first ballot and walked to my very first voting booth, I was so overcome with emotion that I nearly cried on my ballot. Three election cycles after my first (disappointing) brush with democracy, my time finally came. Truth be told, my time came early. The law is, if you are eligible to vote in the general election, then you are eligible to vote in the primary. So, I voted in my first primary election as a 17-year-old. Of course, Indiana has such a late primary election that the nominees are usually decided before Hoosiers get to visit the polls (although, to be fair, not this year). As I recall, Senator Lugar ran for president that year, but was out long before I had a chance to vote for him. My parents voted early the day of my first primary, but I had to wait until after school ("had to" because I wasn't willing to get up early enough to go before school). There was a woman ahead of me, and she pointed out her name on the list because the volunteer was having trouble finding it. I don't remember what ballot her husband had requested, but when the volunteer asked if the woman wanted the same one, she asked for the other one. The volunteer seemed like she didn't know what to say to smooth over her "blunder," but fortunately, the woman laughed and said, "We're a divided household." Then it was my turn, and I also pointed out my own name on list. My mother had voted Democrat, my father Republican. The woman looked at the list, looked at me, and asked which ballot I wanted. (Indiana is an open primary state; you can request whichever ballot you like.) I couldn't suppress a smile (and probably a giggle) when I asked for a Republican ballot. So, first vote accomplished, extra credit (for government class) earned. The first midterm election I remember came when I was in my "good citizen"-producing junior high. By then I was well on my way to being a staunch Republican (much to the dismay of my mother's parents). All I really remember from that election was the amount of time my geography teacher spent re-educating us about elections and the 22nd Amendment. So my freshman year in high school, I spent a lot of time in the presence of my like-minded future Young Republican friends, talking about how Bush was sure to win reelection and how much we didn't like this Clinton character. We all came to school the day after the election in a state of shock, and on inaguration day we all wore black. I have to admit, the thought of any 14-year-old I currently know being that interested in the outcome of this election is laughable. There is an episode of Family Ties in which Alex tells Andy, "Born under Reagan, raised under Bush; with any luck, you may have a Democrat-free childhood." I had thought that was what I was headed for as well. Too bad for me. Anyway, we approached the next midterm with much more seriousness (if that were possible), because it was the last election we wouldn't be allowed to vote in. This was our dress rehearsal, as it were; a time to gather information and make informed decisions without the responsibility to actually go cast a vote. I don't remember the names of the candidates, but I do remember telling my brother and sister that if I were to vote in the state senate election that year, I would have voted for the only guy who wasn't mass-producing mudslinging ads. They nodded and agreed, as is the wont of a 13- and 11-year-old in the presence of the wise 16-year-old elder sibling. Unfortunately, a few days after I made what I though was a reasonably sensible decision, the candidate of my choice jumped into the mud with everyone else. So, I learned not to trust political ads, I guess. Always a good lesson. So, my next foray into the world of politics came with the 1988 election, and this time I was much more aware of what was going on than the six-year-old who wanted to see her favourite newscaster. For one thing, I went to a school that was determined to produce good citizens, so we followed the election VERY closely. We watched the debates (at home). We read the kids' newspapers (at school). One of my friends wore a Dukakis pin every day. I didn't know enough about either candidate's stance on anything to make up my mind, although I did know that Bush was Reagan's VP, so that seemed a good reason to give him a shot at being president. That evening, I recounted the experience for my parents, and my father very helpfully told me, "Well, it didn't count!" So last week, before the Race for the Cure, we had about 40 minutes of Standing Around for the Cure. This week, we participated in the Red Raider Road Race, which is a running club race that happens the week of Tech's homecoming. And according to time-honoured tradition, before the race began, we had a Red Raider Stand Around. This is the most popular West Texas Running Club race by far; this year, there were 457 finishers. (Compared with about 90-150 at every other race.) It didn't look like over 450 people when we lined up to start, but then, we were at the back. Nothing of note happened in this race, except that I was a bit distracted by the homecoming preparations (and students getting their pictures taken by the red tissue paper-covered statue), which did not add up to me running the fastest race of my life. When I saw my time at the end, I thought I had achieved a PR-- until the race results were posted online this afternoon. Dang! Also, a race day is a good excuse to eat cookies afterwards. The "Red Raider Cookie Eating," if you will. I don't know how many parts this "voting" series will end up having, but I basically intend to yammer on until I have exhausted the topic. Do not fear; in no way will I attempt to persuade you to vote for a particular candidate. And I don't imagine I'll even say much about this election cycle (except to note that we have less than four weeks remaining, thank goodness). So, my adventure with voting began, I believe, in 1984. (The reason I believe that is because the only thing I remember from November 1980 is the birth of my brother-- and I only barely remember that. Presidential elections do not figure largely in the ken of 2-year-olds.) President Reagan was running for re-election against someone, presumably a Democrat. Of course, I probably didn't know that at the time. I knew there was someone named "Reagan" that people were always talking about, who didn't seem to be related to the Regan at church. So we got to the polling place, our parents disappeared into some curtained cubicles, and we amused ourselves quietly in a corner (at least, I presume it was quietly; I don't remember anyone shouting at us, anyway). A few minutes later, the parents rounded us up and herded us to the car again. We were confused. I: Where are we going? I: I thought we were going to vote! Dad: Yeah, that was it. In other words, my first experience with democracy was not all that I thought it would be. I may have alreay mentioned that we have two preschool girls in our community group. Well, one of them was missing this week, so the other one had to amuse herself as best she could. The mums were sitting around, enjoying coffee and dessert, and discussing how they dealt with and temper tantrums when their children were in that stage. The little girl wandered up just in time to catch a few words, and then proudly informed us all, "My mama never spanks me to death." 1. Where is your cell phone? Kitchen. 2. Where is your significant other? Left. 3. Your hair color? Reddish. 6. Your favorite thing? Chocolate. 7. Your dream last night? Abnormal. 9. The room you're in? TV. 12. Where do you want to be in 6 years? Scotland. 13. Where were you last night? Here. 14. What you're not? Asleep. 15. One of your wish-list items? Bicycle. 16. Where you grew up? Greenfield. 17. The last thing you did? Run. 18. What are you wearing? Shorts. 25. Something you're not wearing? Shoes. The bloggers that I'm nominating: Whatever. Feel free to nominate yourself. Now, for you recipients of this award, here's the deal:* Display your award. * Nominate at least 7 other blogs. * Enjoy your award! It irks me. It is irksome. Okay, anyone who has known me for more than 30 seconds will probably agree that I have a list of pet peeves, things that annoy me, and odd tics in my brain that is about as long as a roller towel. And I cannot, unfortunately, disagree with this stance. So, I will limit my irked-ness this morning to just two things. 1.) In-depth. I hate the word in-depth. (Okay, hyphenate. Whatever.) I'm not sure at what point my mild irritation at this word being used so poorly moved up a gear to hatred, but it happened. And it is the loose use that annoys me so much. I want to shout, "You can't call something this shallow in-depth!" almost every time I hear it. One of the many poor uses I've seen recently is for our Bible bowl "parent handbook", which quite brazenly lies to the 4th-6th grade parents by telling them that their children will get an in-depth study of (insert book here). Actually, it is quite the opposite; we want the children to learn the words on the page, and we don't delve into any deeper meanings (unless it is to explain something they may not know about, such as "fasting"), trusting that they will get the deeper meanings in a different Bible class. 2.) Officially. I've noticed lately that this word has fallen into the same vernacular trap as "literally." It is used a lot when one actually intends the opposite meaning. For example: "It is officially the end of summer." I can't tell you how many times I read that sentence in a blog over the course of the last two months. I can tell you that summer was officially over on September 22nd. The rot started with aim/Sunset people, who declared summer to be officially over even before the Summer Olympics started. Which shows a startling lack of common sense. Next to fall were the parents of school-aged children, declaring the end of summer all over the web, just because their children were back in the land of learning. Then there were the people who aren't in school and just decided that once Labour Day is past, the summer must be over. Finally, those of us who can read were able to clear up this confusion at the autumnal equinox and declare the official end of summer two weeks ago. And we were the correct ones. If you want to declare the unofficial end of autumn before December 21st, be prepared for me to leave you a comment telling you to look at a calendar. So there you are, my gripes o' the week. Stay tuned for my diatribe on "literally." And then I'll tell you all about how "journal" is a noun, not a verb. I know you just can't wait. So I've been unsupervised at work for the last four days. My supervisor & three other women from the office took off to New York for one of their "girl trips". Which is just rude. I said I was going to run wild around the office, but unfortunately, this little trip happened directly after the end of the month. Dang! So, between my own work and covering some of my supervisor's rather extensive workload, I didn't have much time for wild running. Although, the doctor was kind enough to thank me today for helping out. Also, one of the other girls today told me I "didn't even know" how behind she was on her work. I assured her that I do, in fact, know, being as I am now a week behind on my own account. I have grown weary of the "woe is me" that happens in, well, every office. So, I've just stopped listening. In a completely unrelated topic, has anyone else seen the Bertolli advert with the song from Carmen? It's one of my favourites at the moment. And in another unrelated topic... it's remarkable easy to turn off the television when I have four channels of presidential debate to choose from. No, thanks... I'll just read the transcript later. I just like adding the words "for the Cure" to whatever I'm doing. Thanks, Komen. So, one of my coworkers lost her sister to breast cancer about 16 months ago. Today, I asked her to write her sister's name (it has a different spelling than the "norm") for me so I can put it on my "Running in memory of" sign to wear on my back tomorrow. She nearly started to cry. I didn't mean for that to happen, but you know, if I lost my sister, I wouldn't stop crying for about 10 years. And I mean all the time, not just if someone mentioned her name. Plus, we'll also be eating cake and watching a movie for the Cure, but that's more for Chad's birthday. So on the front page of SparkPeople today, one of the headlines was about how many say the food industry is to blame for the obesity epidemic, and they shouldn't be allowed to get off scot-free for making us all fat and diabetic. So I will say this on the side of the "many who say": Yes, the food industry could make more healthy food and less cruddy food. And here is the logical conclusion to that statement: ... but would you buy it? And there's the rub, isn't it? Yes, the entire food industry could "go organic". Yes, the grocery stores could stock purely healthy, nutritious food. Yes, McDonald's could find many, many ways of cutting back the calories, fat, cholesterol and sodium. But what, then, would the average consumer of calories, fat, cholesterol and sodium do? In fact, the government could step in and shut down the fast-food industry, in favour of healthier options. Wal-Mart could refuse to sell sweets to anyone who appears to have an unhealthy BMI. In fact, skip the "appears to;" you could just weigh in and get your BMI as you come in the store, so everyone knows for sure. Perhaps employers should deny parking spaces to overweight employees, insisting that they get exercise by parking several blocks away and walking. Or, let's just do away with "near" parking spaces altogether, and surround all public buildings with a zone of grass and trees, putting the parking spaces as far away as possible. (Actually, I like that idea.) Car salesmen could become bus ticket salesmen, only selling automobiles to customers who can prove their good health. We can become an communist nation, united by our loyalty to the Health Party and watched over like children to be sure we don't cause undo stress to the nation's already overtaxed medical system. Here's an idea: Let's all stop blaming other people for our bad choices. Don't sue McDonald's for spilling your hot coffee on your lap. Don't blame Little Debbie for your weight gained after munching through a box of Swiss Rolls. And don't think that your jeans being a bit tight is because the cable TV execs are so darned clever that you can't get off your couch! As someone who has to fight for every ounce that comes off of my weight, I sympathise with those who have a rough time of it. But that's no reason to wring one's hands, saying, "Woe is me! A plague upon Hostess!" Fact is, if you are currently doing nothing about your own health, a few small changes will give you big results that will motivate you to keep going. You don't have to be a contestant on Biggest Loser to make good choices. Okay, rant over. Let's all be grownups, eh?